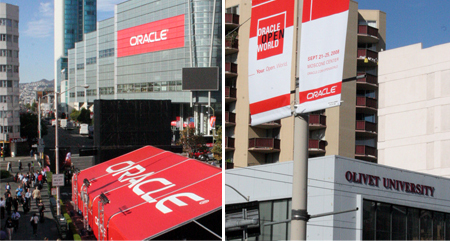 Students of Olivet Institute of Technology (OIT) took part in the latest Oracle OpenWorld convention held at the nearby Moscone Center. The convention features exhibits and seminars on diverse topics including telecommunication, hardware technology, software development, and other IT fields. This year's convention featured special presentations on "green" software and "green" enterprise. This includes software that provides a unique and proven approach to energy efficient solutions. This is done by leveraging techniques and utilizing new IT infrastructure systems. Students were able to get insight into these innovative techniques, view the latest products, and speak with the experts. Among the conventions that Olivet students participate in every year, the OpenWorld convention is largest with over 50,000 people coming all over the world. Oracle is the world's leading database software company. Students took particular interest Oracle's own presentations on database software. Since OIT is offering a course this semester on database design, real-world exhibitions complemented their studies within the classroom.